When it comes to enriching your cat’s environment, you might have to get creative. One thing you absolutely ought to do is create as much vertical territory as possible, using cat trees, shelves, or anything else you can think of, because climbing is instinctive behavior for cats. Toys, hidey holes, and safe, warm beds are also great enrichment. But sometimes, you have all of this, and it’s still not enough. How else can you enrich your cat’s environment? We started a new game with Chase awhile back (it’s actually how we accidentally got into clicker training with him), because we noticed that he wasn’t eating his full meals anymore. He’d eat probably half, and then turn his nose up at the rest. The alarm bells in my head said he was sick, except he was still begging for my lunch and dinner, and he was still all excited about treats. He is great at hiding when he doesn’t feel well, but one telltale sign that he’s sick is that he doesn’t want his treats. So he wasn’t sick. I thought it was likely that he was just bored in some way. He does want to be an indoor-outdoor cat, but we have no way of ensuring that he’ll stay in our backyard, so we can’t let him out, except on a harness and leash. It’s just too dangerous. We had to address his boredom, though. We had to stimulate his mind and his instincts. 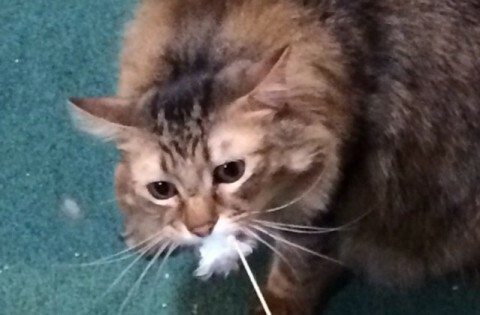 One fantastic way to enrich your cat’s environment is to make him “hunt” for his food. This is what we started doing with Chase. We divide his meals into three bowls, and he gets one bowl in the kitchen, and the other two get placed elsewhere in the house. He has to use his eyes and his nose to find them. Dr. Jennifer Coates, at PetMD, agrees that this is a great way to enrich your cat’s environment. The way she puts it, we’ve taken a species that spent countless hours outside, hunting and scavenging enough food just to survive, and put it indoors with near-continuous access to food, and limited opportunities to really move. This results in boredom, bad behavior, and obesity. 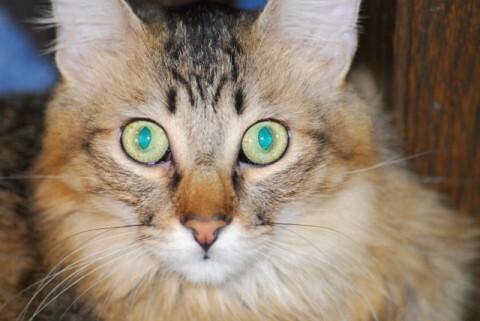 Feeding multiple small meals per day, instead of free feeding, or feeding one larger meal, helps bring your cat closer to what he would have in the wild. While you can’t realistically feed your cat eight to ten small meals per day, you can feed three or four. 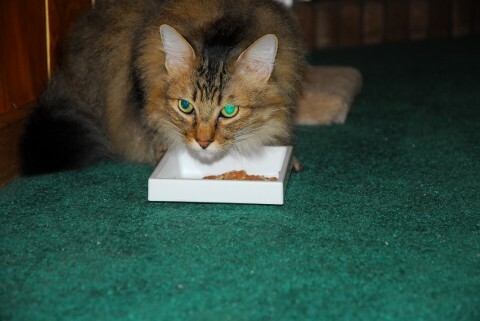 Dr. Coates also recommends using puzzle feeders, or you can take his meals and hide them, the way we do with Chase. You can also teach him to fetch certain objects by hiding them, and rewarding him with treats when he finds them and brings them back. Anything that stimulates hunting instincts will help to enrich your cat’s environment. If you want to enrich your cat’s environment by hiding his food, start small. We started small with Chase, by giving him his usual bowl in his usual place, and then putting the other two bowls just a short distance away, where he could still see and smell them. From there, we put them out of his immediate sight, but still where he could easily find them. Once he had the hang of that, we started putting them up on chairs, on his shelves, and in other harder to find places. It seems to have worked. He’ll still come and cry that he can’t find his food, which is where the clicker training has come in. He also “lies,” where he’ll find all his food, eat all of it, and then come cry like he can’t find his food. But for the most part, he seems happier eating his meals this way than he did when he was eating all of it at one time, in one place.